We’d love your help. Let us know what’s wrong with this preview of Dead Heat by Joel C. Rosenberg. To ask other readers questions about Dead Heat, please sign up. A terrible finish to a truly great series! What was one of the best series out there turned into a flop of a final book to this series. While I am not against the Christian message, to turn one of the very best dead-on series of todays world into a book I would have expected to be written by Billy Graham himself, was a huge disappointment. I found myself turn page-after-page-after-page without doing anything but glancing to see if the religious hodgepodge had stopped. The way this ended ranked up th A terrible finish to a truly great series! The way this ended ranked up there with one of the worst ends to a book I think I have ever read. Rosenberg pretty much removed the main characters from the middle 90% of this book, and then in the last few pages brought the book around to some of the best and well developed characters out there, and in a matter of pages terminated their life and any future of this series. Rosenberg's other books in this series are worthy of the comment on them by Rush Limbuagh as one of the best books you can and should read. This one, however, was a huge disappointment to the nature of this style of a book series. Rosenberg had a good thing going here, and either he fulfilled his contract with this series, or just decided to kill one of the best series - either way, it was/is a shame. I cannot recommend strongly enough the reading of this series of books, starting with "The Last Jihad" and ending with "Dead Heat". Especially during this critical time in world politics. Amazing, fascinating, insightful, and frightening are just a few of the words I would choose to describe these books. "Dead Heat", in just the first chapters, opens with the nuclear bombing and annihilation of four major US cities: Washington DC, New York, Seattle, and Los Angeles where the GOP convention is jus I cannot recommend strongly enough the reading of this series of books, starting with "The Last Jihad" and ending with "Dead Heat". Especially during this critical time in world politics. Amazing, fascinating, insightful, and frightening are just a few of the words I would choose to describe these books. 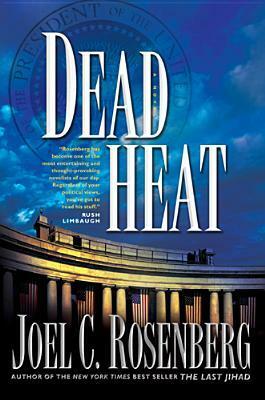 "Dead Heat", in just the first chapters, opens with the nuclear bombing and annihilation of four major US cities: Washington DC, New York, Seattle, and Los Angeles where the GOP convention is just about to announce that the President of the United States is about to address the gathering to announce his endorsement of the new republican candidate for President of the United States. Someone is clearly trying to not only kill the President, but also totally and completely destroy our government. Somehow, the Vice President has managed to avoid the devastation, and is quickly sworn in to take over as President. He faces, however, a horrible challenge. We are at war ... but with whom? The missiles were sent from cargo ships in the oceans off our coasts, and they were most likely a Chinese or North Korean model known as the Sunburn. One of the ships is identified as a Liberian-flagged container ship and is almost immediately destroyed by our military, before she could ready more missiles for firing. Our enemies had decapitated the American government! Is this End Times as prophecied in the Bible? What role does the United States play as there is no reference to the US in the scriptures? I've enjoyed several of Rosenberg's book, but this one is far too "preachy" and too consumed with biblical prophecy of end times events occurring. Also The Last Jihad, The Last Days, The Ezekiel Option, and The Copper Scroll were chiefly concerned with Jon Bennett and Erin McCoy and their Bourne-like political intrigue and willed with action. Not Dead Heat. Bennett and McCoy are almost minor characters in this last book of the series. In my opinion, it was a disappointing end. I've also read Ros I've enjoyed several of Rosenberg's book, but this one is far too "preachy" and too consumed with biblical prophecy of end times events occurring. Also The Last Jihad, The Last Days, The Ezekiel Option, and The Copper Scroll were chiefly concerned with Jon Bennett and Erin McCoy and their Bourne-like political intrigue and willed with action. Not Dead Heat. Bennett and McCoy are almost minor characters in this last book of the series. In my opinion, it was a disappointing end. The last book of "The Last Jihad" series, it was the most riveting one yet. It grips you from the very first page, and take you down paths with twists and turns that you never see coming. The good guys don't always win. Rosenberg seems almost prophetic in his storytelling, which ties in so closely to modern day political events that you can see his story actually happening in the real world. Indeed, some of it has. A brilliantly written book that is near impossible to put down once you start. This is the last book of this exciting thriller. There is much sadness in this book, but at the end there is victory. I believe that some people read this book without reading all of the previous books. I believe this causes a low rating, because each book depends on what was written beforehand. If I just read this book without the previous books, I would also give it a lower rating. Again, a great story line but way too much Bible thumping. I was ready to throw the book out the window several times. The saving grace for me was the ending. It actually brought me to tears and really touched me deeply. This series could have been a 4 or 5 star series if the Christian life and belief system was portrayed in a manner that was more believable and more ... real. For instance, in one chapter, John Bennett is visiting Mordecia and just stops the conversation and prays. It was odd in h Again, a great story line but way too much Bible thumping. I was ready to throw the book out the window several times. The saving grace for me was the ending. It actually brought me to tears and really touched me deeply. For instance, in one chapter, John Bennett is visiting Mordecia and just stops the conversation and prays. It was odd in how it was portrayed. In another, he got on his knees. Who does that nowday? Not that I'm knocking praying on your knees but it is not necessary. You can pray standing up, driving your car, in bed. The point is to do it. Not how you do it. In another scene where the President of the US is accepting Christ as Lord, he is told to get on his knees. If I get on my knees, I often can't get back up. Again, it not how we physically do it, it's that we are engaged in prayer on a regular basis. It's just felt so fabricated for me. I kept thinking, no one I know talks like this or behaves like this. I really wish Chrisitan writers would stop depicting Christianity in this manner. I listened to this as an abridged audiobook while on a road trip. I thought it was going to be a political thriller, but it turned out to be another Dispensational Pre-Tribulation rapture novel of the Tim LaHaye (Left Behind series) and Oliver North variety. A clumsy and heavy-handed approach to sharing the Gospel message using scare tactics. Just goes to show that you can't judge a book by its cover. Great insight on Palestinian conflict and God's plan for Israel. The description of the shoot down of the Air Force spy plane was full of errors. A 707 flying at 49,000 feet? Impossible. A Mig 29 climbing at 65,000 feet per SECOND? Ridiculous. Whew! Joel C. Rosenberg's political thriller, Dead Heat, shakes, rattles and rolls the world of the book and the reader, who invests time in its harrowing events. Book #5 in The Last Jihad Series, I'm behind in reading about the terrifying tales of the Earth's last days before Armageddon in the first four novels. After a brief buildup, Rosenberg jumps right in with the United States under nuclear attack from an undisclosed enemy that decimate several American cities. In his Author's Note, Rosenberg writes:"I pray to God the novel you hold in your hands never comes true. Certainly not as written." Rosenberg further writes that he didn't have a vision and that Dead Heat is a work of fiction; he makes it all up. Over the years, he's seen as a bit of a prophet. Who could argue? The man knows his Bible, he has geopolitical connections and has his imagination. I love this series so am sad it’s finished but a realistic ending. Excellent book!! Sad the series had to finish though. I really feel he could have written a final novel showing how it may be after the rapture. This seemed to go so fast and not involve the depth of the main characters we are used to but a good book to share with someone who does not know how important it is we get our lives right with Christ. An eye opener too as to what really could happen in the not too distant future. Lord, forgive me if it seems that I forget that you are coming back soon. But I know, deep within my heart, that you are coming again, and in light of that I must live a spotless life. Jesus, empower me. Enable me to live in light of eternity, so I will not be ashamed of myself when one of these days you'll return and take me home. And thank you for using Rosenberg's book to remind of these things. I am a Christian... and feel strongly about Christian things and helping people come unto Christ. I also like reading spy books... the previous 4 books in this series found a good balance between these two subjects... this, in my thoughts, did not. It felt forced. It felt like the author was just trying to complete the series. I’m glad I read the entire series... but this was like watching the last Seinfeld... a complete let down after an otherwise solid series. Interesting read based on things that have been happening in the past few years politically and globally. Thriller genre with nothing seeming to go the way of the main characters who go from one crisis to the next with no obvious way out until the almost unthinkable happens. Not that I would agree with the interpretation but definitely one to provoke some thought and endless discussion. A very mixed-up book with equal parts of religion dogma and nuclear war. The USA is attacked with nuclear bombs, the president, his successor and HIS successor are killed and so are most of the main characters. Some of the descriptions of the chaos that results from the attacks are interesting but mostly this is a book to be ignored. Disappointed, don’t see why it was a bestseller, the book seemed to be done by some manic. The author wants to spread the love of God, but he made the belief in God too convenient, characters jumped to big fans of God really too soon to be convincing. In the end, God made people disappeared, what a crap. Everyone needs to read this series!!! Well written author with real world issues. Must read for all!!! A small way for you to understand our world. Please do before it's too late!!! As with the other entries in the series this one delivers, riveting from the start and continues to remind the readers of our need for a Savior and how to find that Savior in Jesus Christ. Once again, I am enthralled with this author's story. I love the way he weaves scripture throughout his novels helping me picture modern applications. Can't wait for the next series! The last few chapters is not what I expected. It comes depressing and sad. Not what I expected.